Siberians revered a white-maned Old Woman who was also a Mare. Ayyyhyt sits by the Tree of Life at the crest of the central world mountain. All-knowing, she inscribes the fate of all beings on its leaves. This "gentle Creatrix" causes women to conceive, protects them in childbirth, and provides newborns with lifeforce and "a ceaseless breathing." The Yakut called her Ayyyhyt or Ayisyt, Birth-Giving Nourishing Mother. 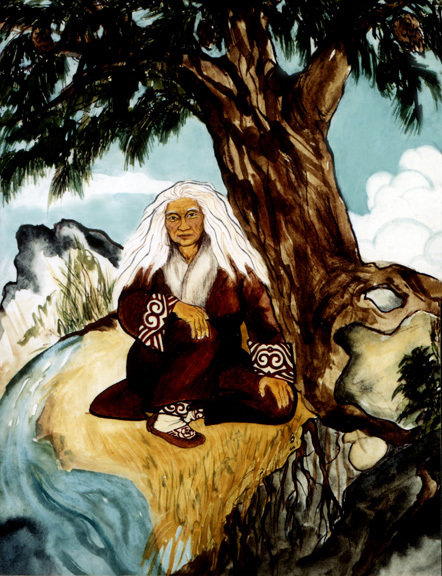 The Altai Turks knew her as Milk Lake Mother, the giver of all life. An endless stream of foamy moisture flows from the Tree to the holy Earth, forming a lake of pure milk. Its life-force causes growth, gives strength to the weak, and heals the sick. Laserprint (11 x 17): $25. Fine giclee on canvas (18 x 24): $300.